One week ago, the people of Kefalonia, Greece were ecstatic as none other than house music superstar DJ Timmy Regisford dropped the beat that would set off the Can You Dance To My Beat Festival. 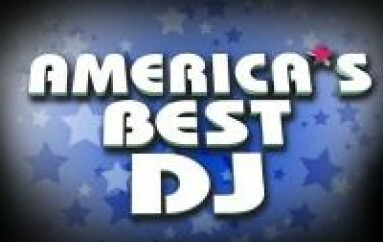 As the crowd expected, Regisford went in, giving them a heavy dose of hard hitting house tunes. As happens these days people took to Twitter to sing his praises and even tweet about something he usually does: “Shirt off 4th song in.. the one and only #TimmyRegisford!” tweeted user username removed by request. Everyone was happy. All was good and the festival went of without a hitch. Three days later another tweet about Regisford hit Twitter. This one however wasn’t full of praise, in fact it was the complete opposite. Who would say anything bad about Regisford? Must be a house hater, right? Not quite. Twitter user @restrictedzone alleges via Twitter: “#TimmyRegisford is such an impostor ; stealing music from South African artists then selling it under his own name $2.99 per track..” He then added two more tweets with links to specific tracks on Regisford’s Soundcloud page, which he claims prove Regisford is essentially stealing other artists music. Over the next few days that original tweet and the follow up ones were retweeted over twenty times combined. Today the image you see above landed in my Twitter feed. Definitely not a trending topic in the Twitter world by any means, but in the still relatively small world of house music this is major news. So, what is going on here? 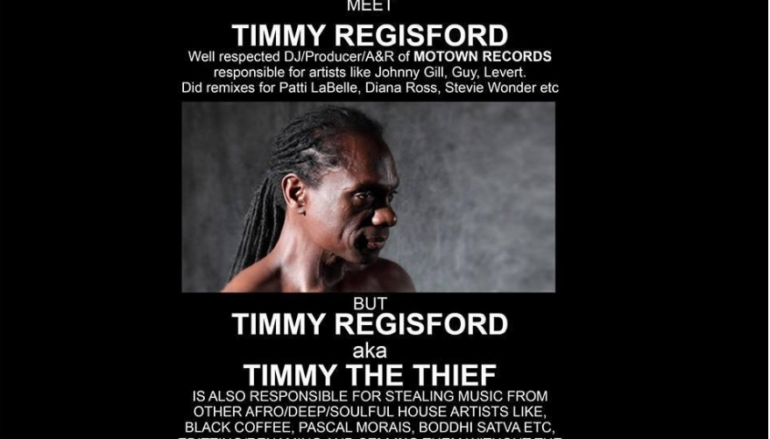 Is Timmy Regisford really stealing other artists music and then selling them on his site as alleged? Or is this an unwarranted attack based on some misunderstanding or perhaps simple jealousy? Needing answers, I took a look at Regisford’s Soundcloud page. He has 449 songs posted. Most of them are labeled as remixes. Many of them have a buy button. The latest songs posted led to a site with the words SHELTER blazoned in large letters across the top of the page and a list containing 25 songs each for sale for $2.99. 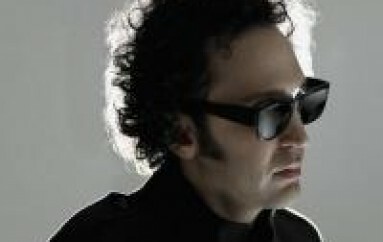 The page claims to be for a 4 day sale of SHELTER MUSIC EXCLUSIVES. The sale was supposed to end on August 16, though the page, hosted by ConstantContacts is still up as of this writing on 8/21. Personally, I find it weird that eight of the songs do not have a name for the original artists. But, since the page is not top quality to begin with, this might be more a reflection of an incomplete job by those behind the scenes than a sign of nefarious activity, right? Other tracks point to other similar constantcontact pages for different months, each offering 25 tracks more or less and all for sale for $2.99. Some of the buy links point to other entirely different sites, but these too provide links to a slew of remixes. The original post that opened Pandoras box alleges Regisford was stealing from South African artists, but from what I see on the various pages I came across, his remixes span the entire dance and pop music world. Not only is there music from SA underground artists such as Black Motion, Kiu, Wendy Soni, DJ 2shott, but also from famous if not legendary artists such as Jill Scott, Maxwell, Jamiroquai, Usher, Teddy Pendergrass, Prince (he better not find out or heads will roll), and well, the lists go on and on. And they are all for sale. Still, this could be all legit, right? Maybe the artists are receiving their proper payments behind the scenes and this is simply just a case of Regisford’s team doing a sloppy job of putting up quick pages advertising their sales and not having time to put up all the proper credit and copyright info. Maybe. Fact is, though the tweets continue to climb and some are calling to “unite and expose the fucker,” this is still a developing story. These are very serious accusations, a mans reputation and his livelihood are on the line. So serious are these accusations, that even if it turns out it is all a misunderstanding, it could still impact his career. So, we must all tread lightly while trying to get to the bottom of these allegations. We are reaching out to the poster of that original tweet to ask him what he knows, perhaps an interview will come of it. And despite the examples he published, I have only seen one artist come forward, and that was via yep, you guessed it, Twitter. We’re going to reach out to him and anyone else who claim they have had their music stolen. Lastly, we are going to reach out to Timmy Regisford himself. He deserves a chance to tell his side of the story. Of course, this won’t be easy. The famously tight lipped Timmy Regisford is not one for interviews, and who knows about those in his camp who will undoubtedly be affected were any of these allegations found to be true. Seven days since that original post and nary a word from anyone. Like a club the afternoon after a party, all is quiet. But don’t worry, we’re on it and when we get more info we’ll do like a club on Friday nite and put it on blast. UPDATE: The Twitter user who made the comment about Timmy Regisford being shirtless wanted her name removed so we complied. UPDATE 2: Since this topic is creating a lot of discussion, we have set up a forum topic in our forum section. Feel free to join and contribute to it. You can access it here. If you are an artist claiming to have had their music copyrights infringed upon by Timmy Regisford or any other DJ/producer and have any proof that this is the case please reach out to us. If you are a rep, or a member of Timmy Regisfords team, or Mr. Regisford himself, please reach out to us as well. What are your thoughts, nothing to see hear or do you believe it is straight up wrong for anyone to do, especially for a big name figure?